Sometimes, you just want to eat a sandwich. And not just any sandwich, but something that really makes it worth the sodium, fat, and carbs you're getting. Ah, carbs, I love you. ANYWAY, this easy easy easy slow-cooked French dip sandwich was so flavorful that it was hard to stop myself from going back for fourths. Not only is slow-cooking such a simple way of making things because you literally set it and forget it for the day (and you can leave this roast in longer than 7 hours if you're going to work for the day), but it seems to make everything taste so delicious! As my husband watched me prepare the meat in the slow-cooker with the budget-friendly short ingredient list, he literally looked at me and said "That's it?" and I proudly chimed "Cooking a good meal isn't that hard, sweetie!" (hoping that he might take up the hobby). Trim fat. Season roast on all sides with garlic salt and pepper. Place in slow cooker. Pour french onion soup and beef broth on top. Cook on low for 7-8 hours. 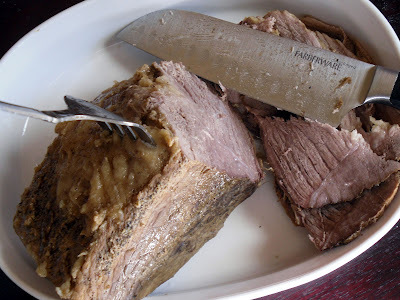 Remove roast and cut into thin strips. Return meat to liquid to absorb more flavor. 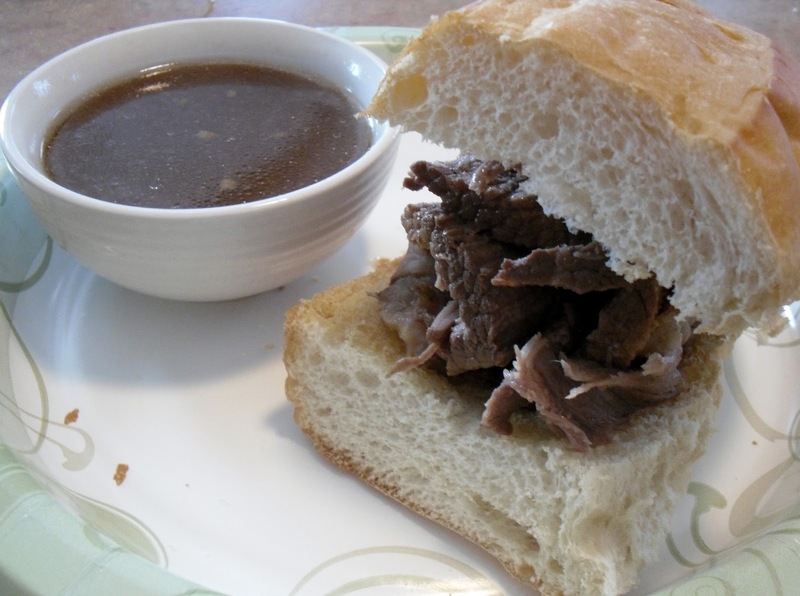 Assemble sandwiches and ladle liquid into a small bowl for dipping sandwich. Enjoy! Sawyer usually leaves us alone when we cook but he was really hoping we'd drop a piece of that amazing smelling roast!